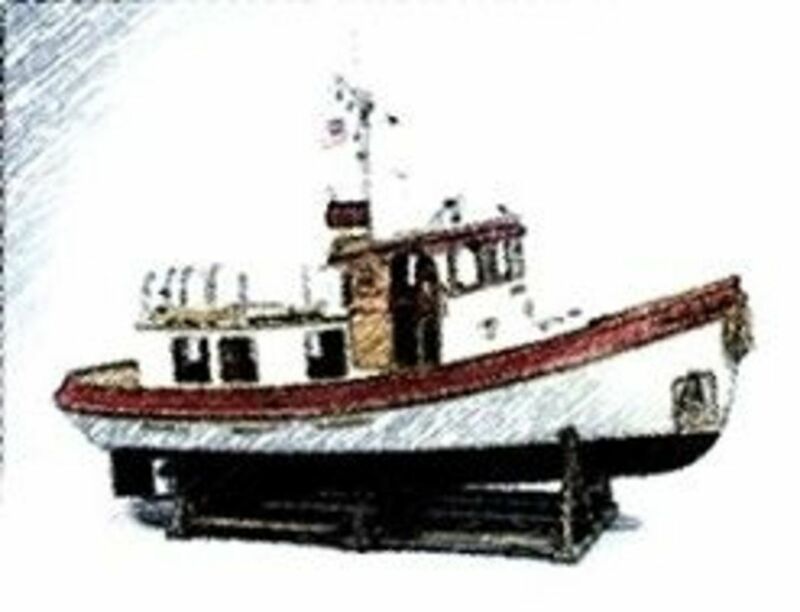 This story starts with a Lord Nelson Victory Tug, 37 inch. My step dad became ill in 2000 with COPD. That's a lung disease for those of you that don't know. My mother and step dad had moved to CA from OR, because of the low humidity it was good for him, but not the heat in the summer. My mother and sister was in a hobby shop looking for a good hobby that my step dad might enjoy because he would be spending most of his time indoors. She knew he liked planes and boats, so she sees this 37' Victory Tug. That's how this boat ends up at her house. It cost about $300 in 2003. How did I end up with finishing the build? At the beginning of his illness he was able to wear a dust mask, and was on a lower oxygen. As his illness progressed he was not able to walk for long distances or stand very long. Walking to the restroom was a big challenge for him. He got to weak to cut boards. He spent most of his days talking on his radios to friends. My step dad became frustrated with the build of the hull is my only guess, and his condition became worse. Mother says he quit working on it in 2007, and started other projects. However, he past away in Oct, 2011. 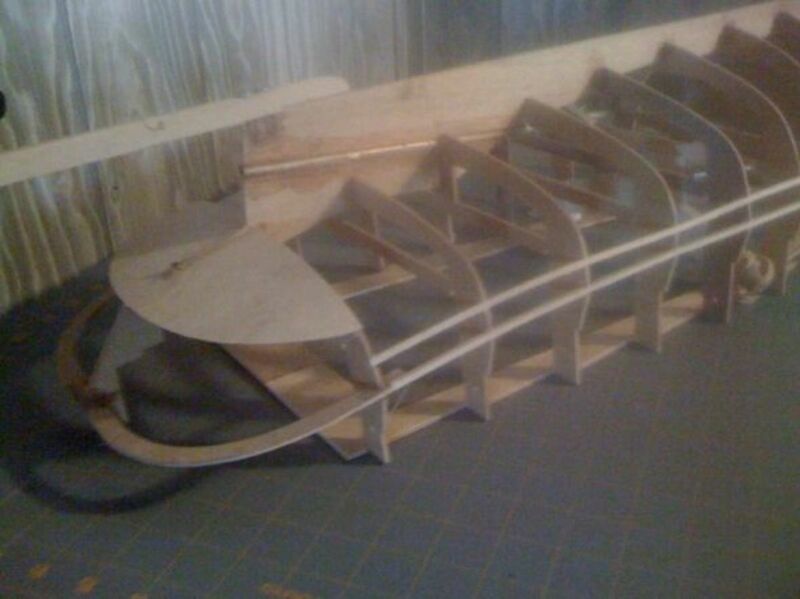 Which I had move out to CA in May of 2011 from IN, so I have decided to finish the task of building this boat. The picture to the left is what the finished product will look like. After it's finished it will be remote control operated. Yes it will float. 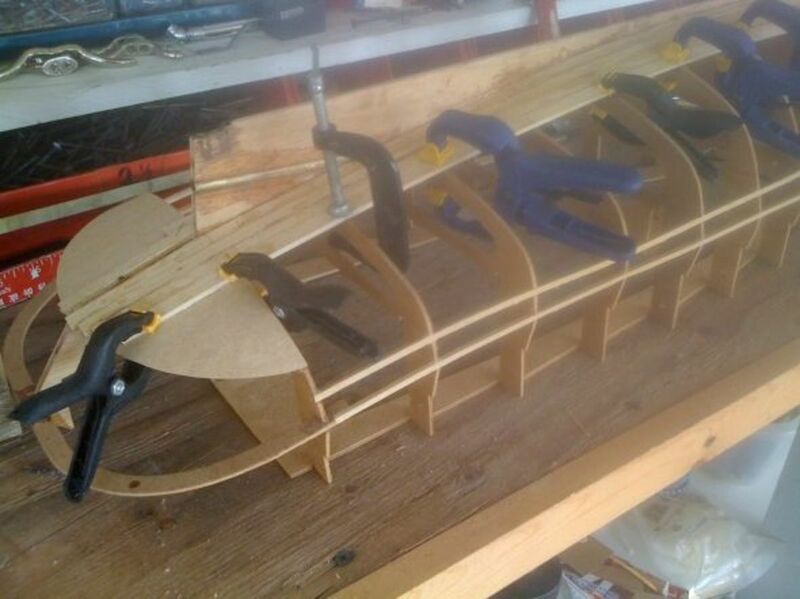 This is what the boat will look like once you get frames 1-10 glued to the keel. It doesn't look like much at this point, but it isn't as hard as it looks to put together. You will need to have a Dremel tool which is very handy. Quite a number of clamps to hold the boards in place. Did I mention there is a large diagram that comes with the boat for assembly. I really don't know how he got it this far because the instruction are not very clear. His diagram of the boat was really faded when I got to the project. There is an instruction booklet that comes with it, and they are not to difficult to understand when used with the diagram. Really they could have put more detail in describing what they are talking about. If you reread it several times and look at the diagram it is somewhat clear. I had to look online for people that were building them to get a clearer picture in my head. They use boating terms to describe everything which I am not to keen on boats. The diagram does show the names of the parts. The real problem I had was this boat and the instruction were sitting in a shed for about 4 to 5 years, so they are faded. 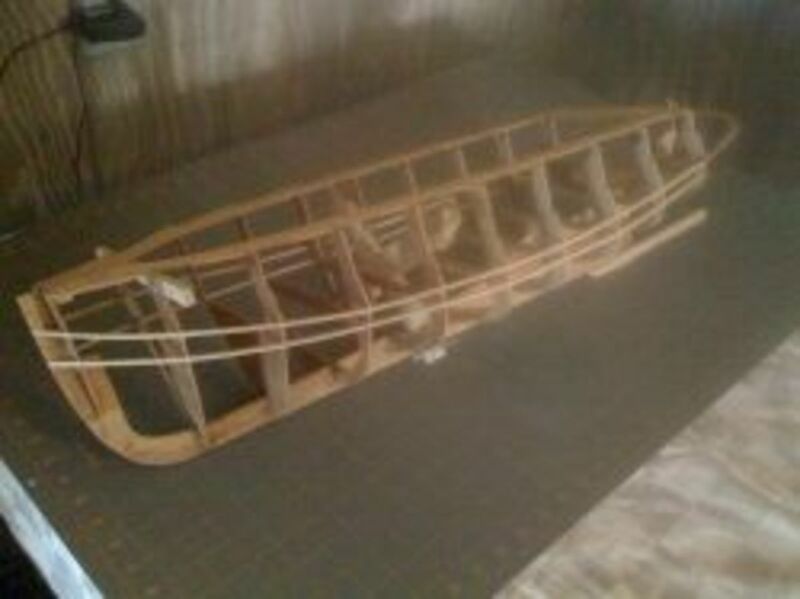 Finding online details to build this boat is very rare. I did find out that the manufacture of these kits do sell the instructions and diagrams separately. Shifting gears for a moment lets focus on safety. Safety should be a high priority of anyone working with power tools or even sanding any type of wood, plastic, or steel. I have on a number of occasions had to go to emergency rooms to have glass or steel removed from my eyes. Of course I was wearing the required equipment that employers provide, but regular safety glasses may not keep particles from going up under the lenses. Little particles can easily go up under safety glasses and shields or even both. Tight fitting safety glasses will prevent this from happening. Never try to remove any object from your eye let a doctor do it. I am not talking about some dust between your eye and eyelid that water can wash out. This is little particles that get stuck in the eyeball. When you blink your eye you will feel the object rub your eye lid, and your eye will start getting red. They will numb the eye you won't even feel them remove the sliver of wood, glass, or steel. They will use some tweezers to pull it out of the eye. Unless you have a very large piece in your eye. A good pair of safety goggles will help to protect your eyesight. Don't take chances with cheap safety equipment. A dremel tools is just the right tool to cut off the planks at the front of the keel and at the stern. It makes it nice to do detail work on this victory tugboat. It was easier in some cases to sand off lumps of glue. My step dad had bought his dremel tool in the late 80's, and it has seen it's time of crafts. While using it to cut the planks at the stern a part inside had finally given up the ghost. There is a little rubber tube like piece that connects the motor to the shank that you put the accessories in. You can purchase them online for like $1.50 or just use a 1/4 clear plastic tube from airline hose. Like the tubing you see people using with their oxygen tanks. You only need a 1/2 inch long piece to repair the dremel tool, and you will be back in business. I might later in the lens upload some photos of how to repair this tool. It's very easy to do. As you can see it look really rough, and may even be hard to see how this will look. The finish product will have a fiberglass hull. Building a Victory Tug doesn't have to happen overnight. Working on this type of project can be do over a period of time. 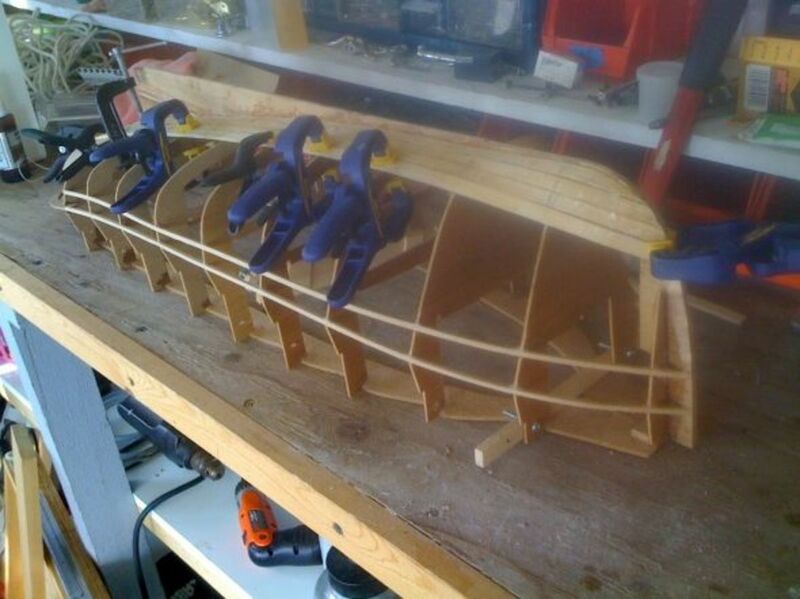 If you decide to build any type of boat that will float you will need to use waterproof glue inside and out. Not water resistant glue there is a difference. You don't want your boat sink after the glue gets wet. No matter how much sealant you use there is always the chance that water will make it's way to a glue joint. If it's water proof glue no worries. If you don't have accessories for your dremel tool it makes it hard to do anything. Having extra is also wise because you never know if the cutter will wear quickly. Usually the sanding barrels will last quite some time before wearing out. 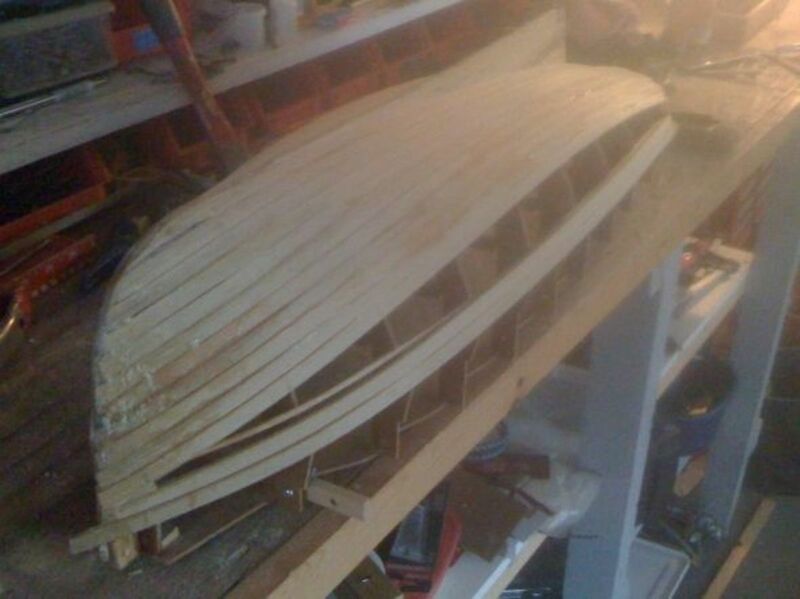 The idea is to take the planks from the keel to the stern of the ship in one long piece. As you work upward you will have to use shorter pieces to fill in the gaps. This really is not to critical. The outside of the hull will be fiberglass. Basically the planks are there to be use as a mold. You will need to attach the remote control motor, and all the working of it to the inside bottom of the hull. That happens in later steps. It is good to sand the planks after they dry as you build the ship. 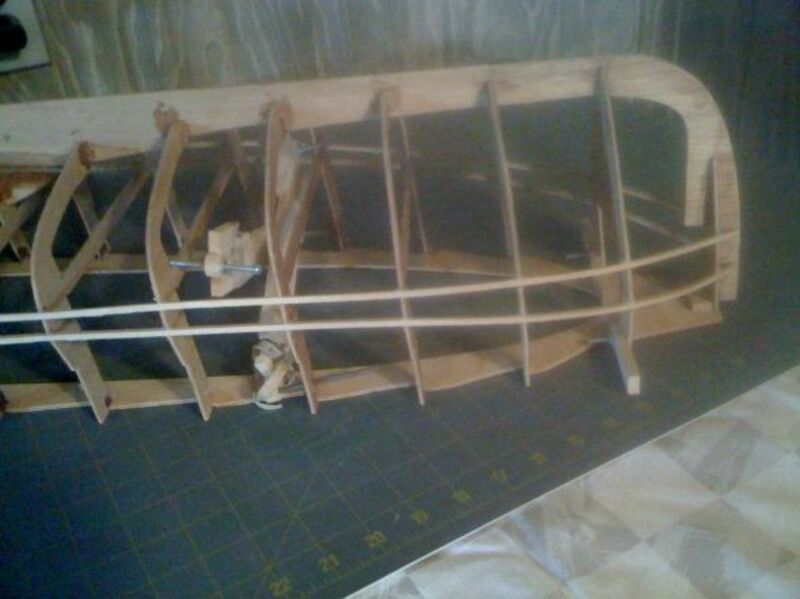 It makes it look good as you are building, and before the fiberglass goes on it will have to be smooth. I would do this after each set of boards were dry. Sometimes you can sand one side while the other side is clamped up. Soaking the boards in water and fabric softener was the recommended method. The glue will dry if the boards are wet. The boards have to be bent around the frames to the front of the keel. I would do this and clamp them on till they dried. Then I would take the clamps off, and then glue them on clamping them again. The reason was the glue takes till next day to really set. If the boards had a big bend in them the glue sometimes didn't hold well if they were not bent first. The glue I used would have worked if the boards were wet. I didn't want to risk it. After all this is a project that takes lots of time. To me it worked better to let them dry to form of the bend that they had to conform to before applying the glue. Hands down this is the best glue for any project, but it does expand. You will have to sand it or use some other method to remove excess. Best of all it is water proof, and it doesn't take a lot. Having a variety of clamps makes a difference. The quick grip clams are nice, but in some of the spaces the skinny C-clamps were more convenient. 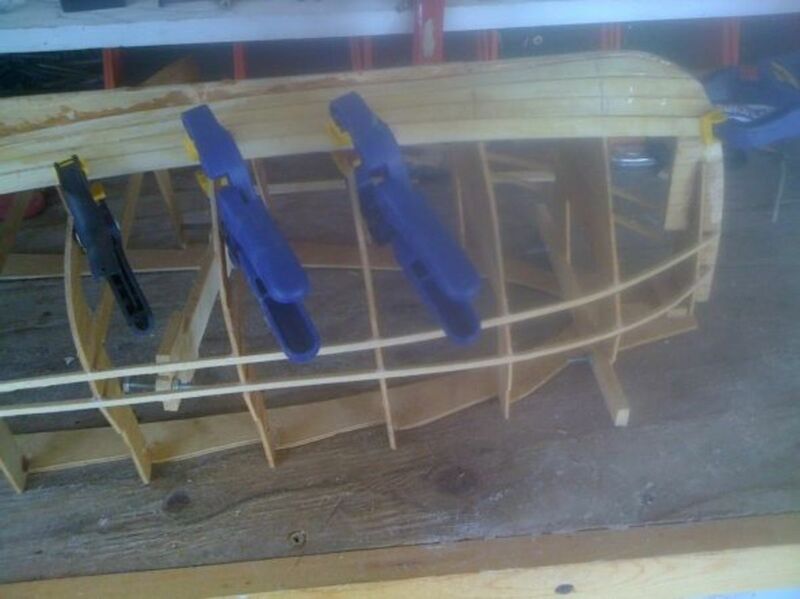 At this point of building this boat my granddaughter was born. Which I was only about a week into doing this project. Feb 15, 2013. My Three year old grandson was sure happy to see her. 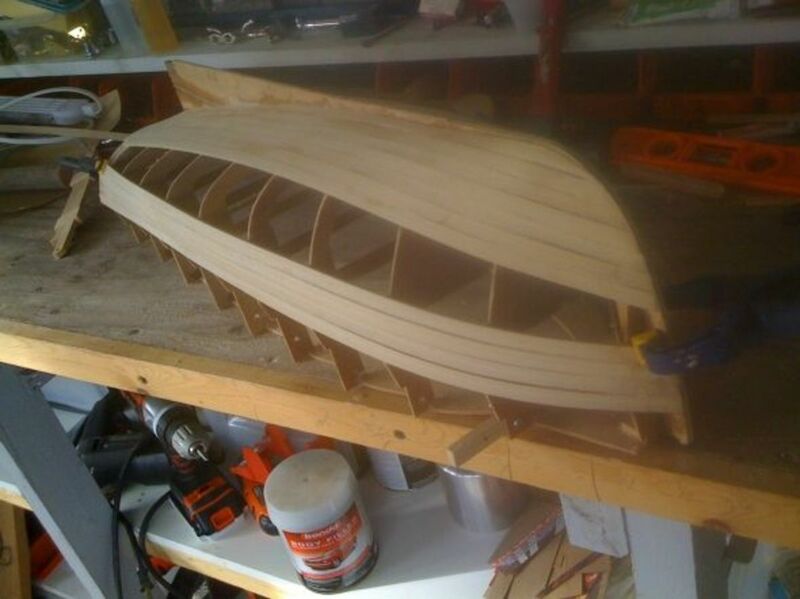 The planks should be beveled at the front edge of the keel. I had to remove these on this side to start over I had used a different glue, and it didn't work to well. I finally got it figured out. Use a sanding block. As you can see in these pic's it takes a lot of clamps to keep the planks tight against the frames. The keel is the hardest place to clamp the planks, and that is because the clamps kept slipping off. I had quite a few different ideas about that as I went along which you will see in later pic's of the project. 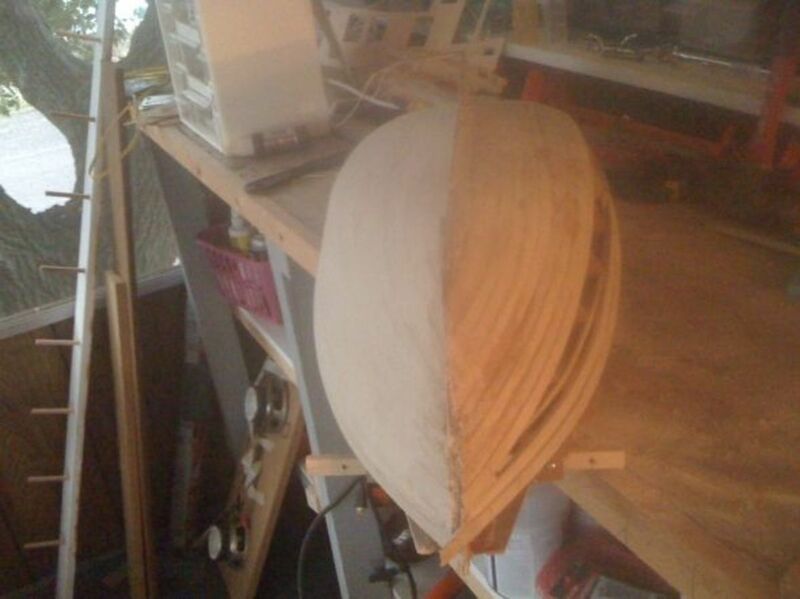 At the back of the stern the planks can hang over, or if they are shorter you can use shorter ones to fill in. The planks that hang over will be cut off using the dremel tool. At this point I wasn't sure how to fill in the rest because the ends were narrow. As you can see there will be gaps between the planks, and some may even be raised higher in places. The gaps will be filled in with wood putty, and use sandpaper to make the planks smooth with each other. Wood putty can be used to make the planks flush with each other. The main goal is to make the hull smooth on the outside for the fiberglass finish. The reason for starting from the top edge of the ship is that board has to be flush with the rub rail. I found out afterwards that some start from the rub rail and work toward the bottom of the keel. However you decide to do it that one board needs to be flush with the rub rail. 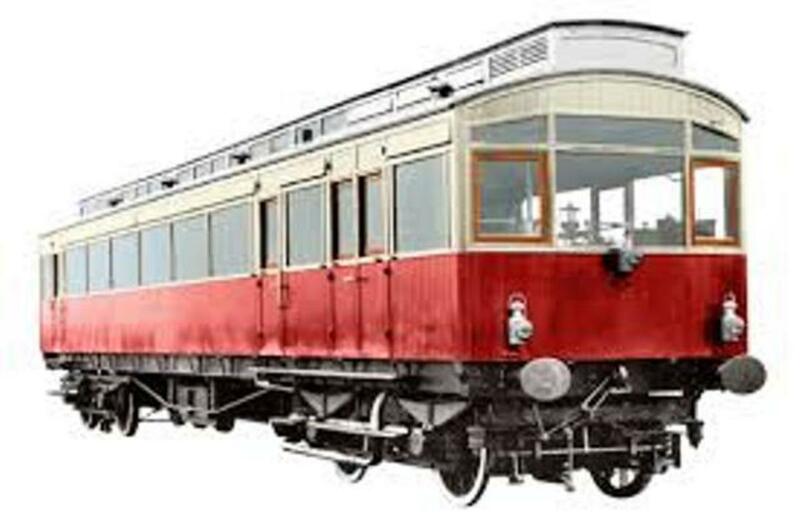 If you look in the pic above this one you will see two skinny rails on the frames. the one on the bottom closes to the bench is the rub rail. If you decided to purchase a model to build they range between $200 and $300. I did see someone selling their's online, and they wanted around $1,500 for the finished product. With the time and effort if you didn't want to build one you could have someone build it for you. I think that's a very reasonable price maybe even more, but that depends on how bad someone would want the boat. I was thinking after this project is complete I would build the U.S.S Constitution. They have wood projects of the ship, but you have to do a lot of detail to get it right. Meaning you would have to carve the little parts. Unless the use a lathe to detail all those little parts. From what I could read about it you would have to hand craft every part to the ship. However, I just might stick to the plastic model of the US Constitution because the wood model requires more detail. If they had a very good description on how to make those parts I might be more likely to do it. Some refer to this as the Lord Nelson Yacht or the Lord Nelson Victory Tug. It's not a tugboat it is a yacht. The name can fool you. From what I could find on the Internet there were 86 of these boats built between 1986 & 1997. Then they quit making them. The length of them ranged between 37 feet to 49 feet. You could purchase one for around $200,000 or under. This depends upon the seller. Wood model ship kits are challenging to build, and learning the terms of the instructions are to be expected. At this point clamping the boards to the keel on the opposite side was all together another story. The instructions say to use 5 min. CA glue which will dry instantly, and they will not need any clamping or soaking for a long period. The hobby shop in Sonora, CA didn't have this type of glue, so I used gorilla glue. Which works really well, but you must clamp the boards. My step dad had some 5 min. CA glue it didn't work like they described in the directions. I decided not to put to much effort into finding the type of glue they used. As long as the glue is water proof it will work. 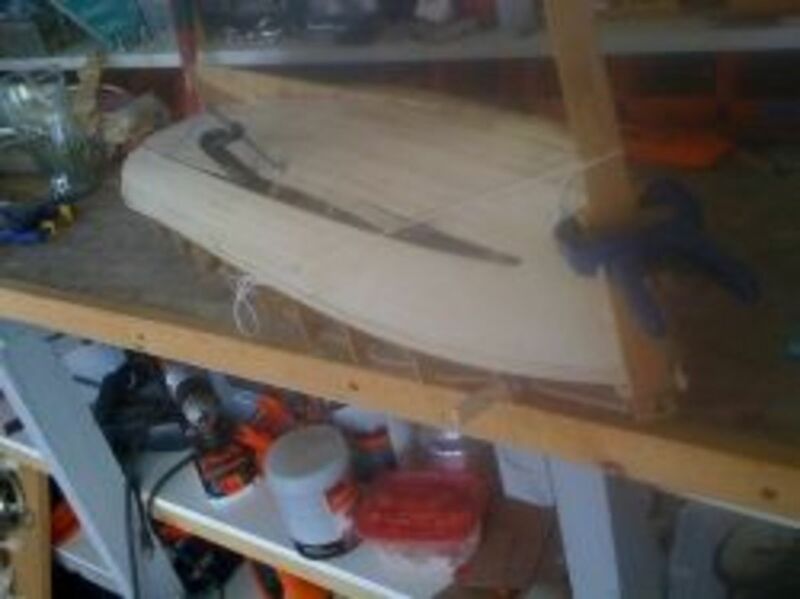 I screwed a board to the top of the keel and tied a it off to one of the frames as you can see. The opposite side of board I screwed on is were I am gluing. This kept the clamp from slipping off. Once you get to the very top you can clamp to the top of the frame. As you see in this pic and the above pic I started from a place high up on the side and started working back to the bottom. There is a rub rail there as noted above in previous section, and that board must be flush with top of this inner rub rail. Once this board is in place you must use a black felt pen to mark the top edge so you can see it later. This is were the rub rail will be glue to. To close up these smaller areas I just cut boards to fill in these areas. Most of them I cut points on both ends to the shape of the openings. This required to test fit the boards before gluing in place. It looks a little ruff, but a little sand paper will smooth it out. Then use some wood putty to fill in the rest. Mine looks a little ruff compared to some I have looked at online. The main goal is to have a smooth surface to fiberglass. It's not real critical to have it perfect as long as the hull is smooth. 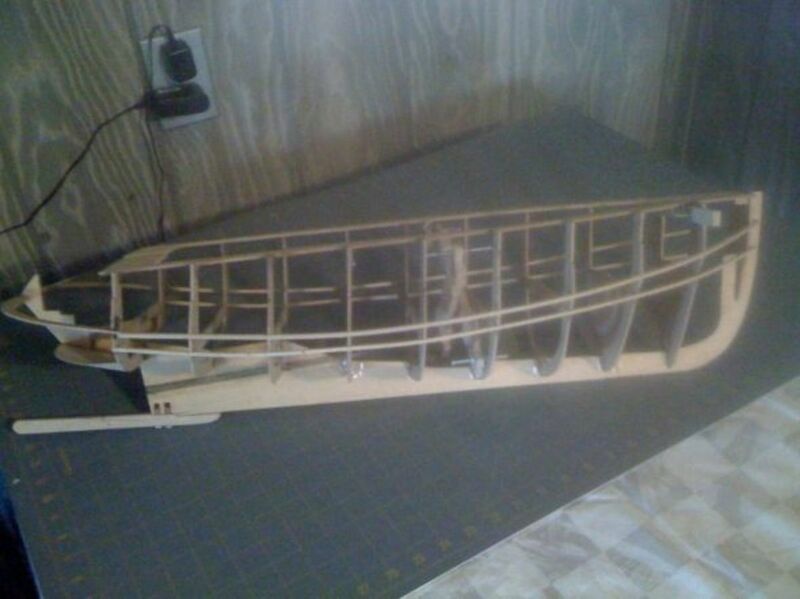 As you can see in this front view of the model ship the left side is looking good. The left side looked ruff like the right side, but sand paper and wood putty makes it look really good. Take some time to get it right, and the fiberglass will look really good. I have a lot of pic's to upload, but I am not done with the boat. It is a long project, so I'll keep you updated with fresh info. 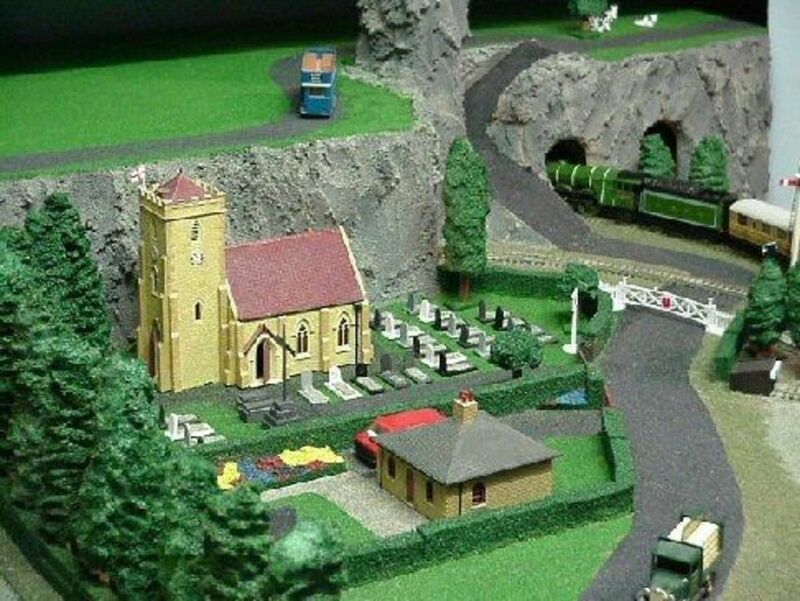 The only model's I have ever built were plastic cars as a teen and when my children were young. This is quite the challenge. Lovely message in your bio, curtis62! Accept my sympathy on the passing of your step-dad. 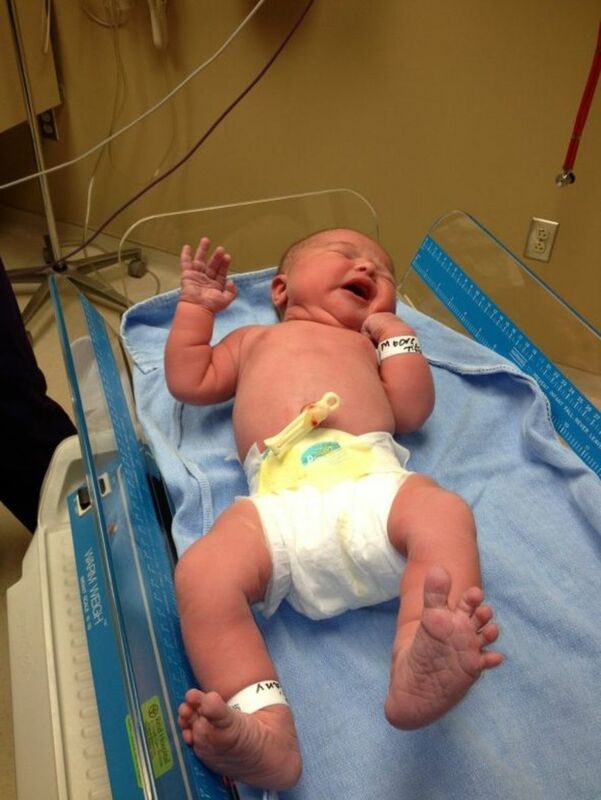 Congratulations on your grand-daughter! I hope you get to finish you Lord Nelson Victory Tug in your step-dad's honour. What an awesome hobby! I've always loved models but haven't had the time. You must have quite a sense of pride at your accomplishment. @Elsie Hagley: Thanks for stopping by my lens. It took me awhile before I decided to work on the boat. Nice well explained article, looks a little hard for my swollen fingers to manage. Like the photo of granddaughter, look like she was a big baby. @artbyrodriguez: Thanks. I am still thinking of what to add in the pole module. What a great subject for a 'How To Lens". 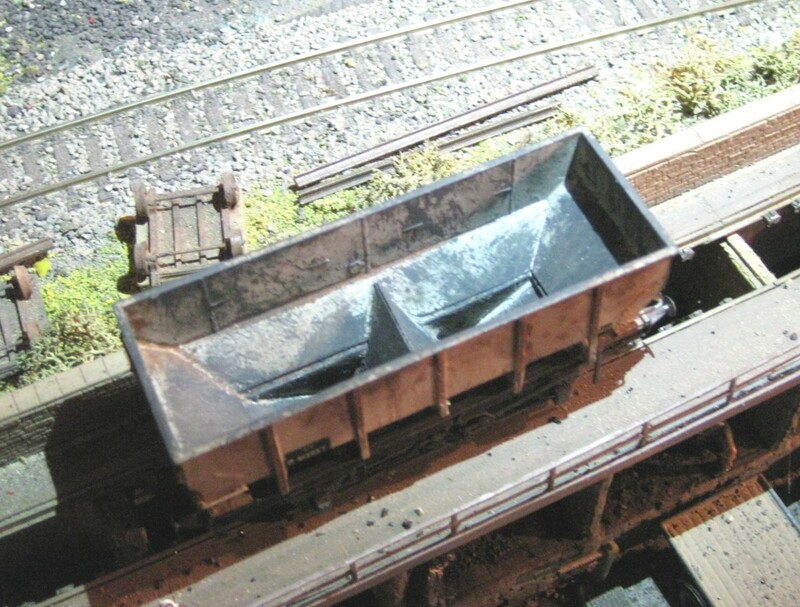 I like the story of how you ended up working on the model. Good photos, especially of the Grandbaby. RocketSquid tip...add a Pole Module with a related question to involve your readers in the lens. Good work!